The UNIGIS International Association has announced it has named Nathan Novak runner-up in its 2016 Academic Excellence Prize competition for his thesis work conducted at the University of Southern California Spatial Sciences Institute’s M.S. in Geographic Information Science and Technology (GIST) graduate program. An independent review board analyzed master theses nominated by UIA centers, which are the world’s leading academic programs in geographic information science and systems. Using the criteria of technical quality, quality of literature review, relevance, presentation and originality, the UIA review board recognized Novak’s thesis entitled “Predictive Habitat Modeling of Sperm Whale (Physeter macroceaphalus) within the Central Gulf of Alaska utilizing Passive Acoustic Monitoring.” In his thesis, Novak proposed an elaborate modeling of sperm whale habitats within the Central Gulf of Alaska using a range of geospatial data. His novel research also was performed in association with Bio-Waves, where he worked together with leading experts in the field of marine mammal acoustics. For his prize, Novak will receive a certificate and 500 euros. He and the other winners also are receiving a free ticket to the annual GI Forum to present their research, which will be held July 4-7, 2017 in Salzburg, Austria. 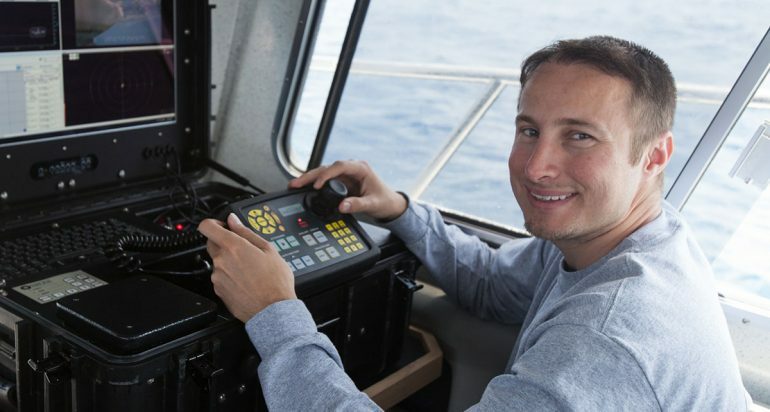 A 2016 graduate of the USC GIST Graduate Program, Novak is Geospatial Technologies Manager with Orca Maritime, Inc., which specializes in underwater imagery and data collection using autonomous underwater vehicles (AUVs), remotely operated vehicles (ROVs), boat systems and human divers. Novak has presented his Orca Maritime GIS team’s work at the Esri 2015 Oceans GIS Forum on advanced techniques of using ArcGIS for identifying and mapping Explosive Remnants of War (ERW), and in 2016 on processing data from unmanned vehicle sensors. As a leader in underwater site management, his team offered solutions to building geospatial infrastructure relating to the scalable collection, processing, storage, and effective display and analysis of underwater infrastructure and resources. The tools and technologies applied were customized using highly specialized commercial off-the-shelf products and extensions.